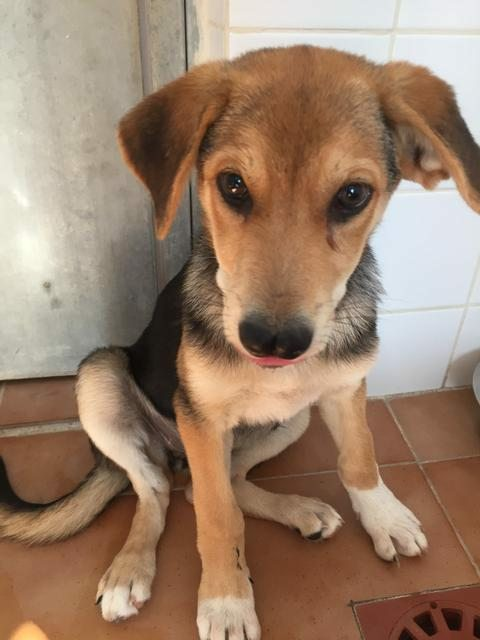 Petra is 4 month old female Collie Cross. Petra is a pretty little tan and black puppy girl who is very sociable and playful and loves playing. Petra isn’t going to be a big girl, just medium at most, and she has a bit of growing to do yet. She is a pretty looking puppy that will fit into a family home with or without a cat (cats are bigger than her !). Petra and her brother were just left at the shelter gates one night without their mum, in a box so there is no history about them. No signs of food guarding. She will not be housetrained as she is at the shelter. Too young to be neutered. Current location is in Spain can travel to the UK once she has a home to go to. Vaccinated, wormed, flea treated, Too young to be neutered but this must be done when they are old enough by the new owners, Microchipped, Pet Passport. 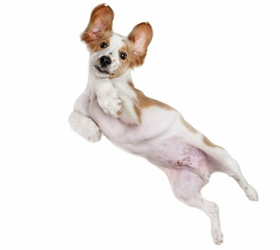 FREE 4 weeks Pet Insurance to be activated from the link on our website. Any known health issues NONE KNOWN. For Dogs coming from Spain: This adoption fee is a contribution towards the costs of rescuing the dog- microchip, passport, vaccines, tests for S European diseases, neutering (if old enough), parasite treatment and transport to the UK. We can not home dogs from Spain to people who work full time or long hours, unless some sort of doggy day care is offered. They need someone at home a lot of the day, they are not used to being alone for long periods. A dog walker for an hour out of the day is not enough.